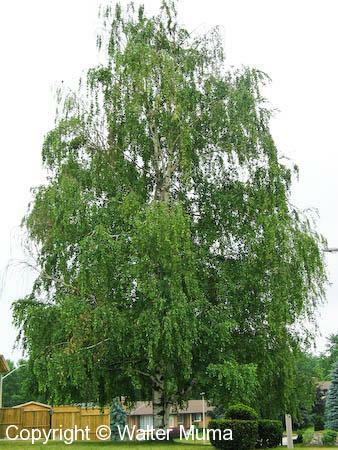 Distinctive features: Tree; A birch with white bark and "weeping" branches (hanging down). 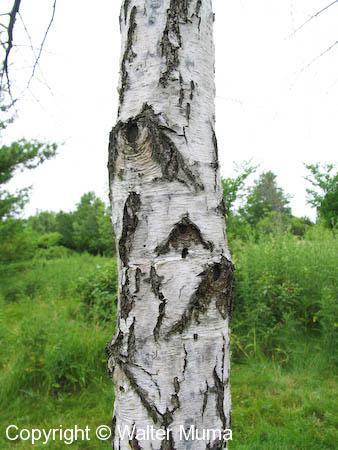  White Birch (Betula papyrifera) - Both have white bark; White Birch peels a lot more; European White Birch has "weeping" branches (hanging down).  Gray Birch (Betula populifolia) - Branches are not weeping, leaves are quite pointed. 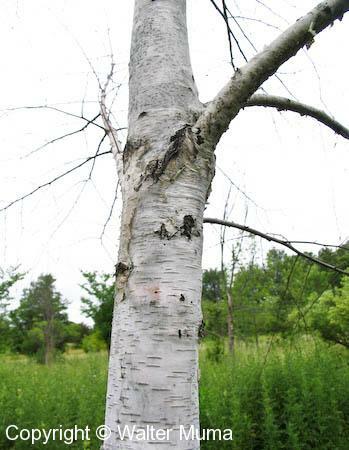 Notes: European White Birch is often planted as a lawn tree. Photographs: 9 photographs available, of which 3 are featured on this page. SCROLL DOWN FOR PHOTOGRAPHS. Typical growth form of European White Birch. PLEASE NOTE: A coloured Province or State means this species occurs somewhere in that Province/State. The entire Province/State is coloured, regardless of where in that Province/State it occurs.